Posted on June 1, 2017 by Matthew Mahalik. 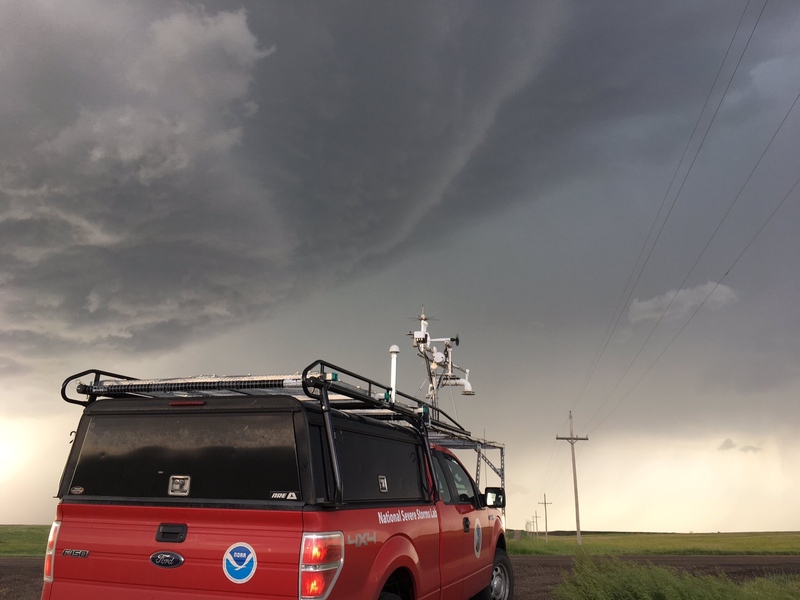 We headed up to northern Kansas for a marginal risk severe weather day, with a cold front dropping south from Nebraska into a hot and humid airmass entrenched in Kansas. With a very marginal setup and less than two percent tornado probability, we needed a very specific scenario to take place for today to be a success. The shear across the cold front was in place, with respectable northeasterlies to the north, and a weaker flow out of the southeast in the warm sector. To the north, the wind profile was right for supercells, but it was likely too dry to get sustained rotating storms. To the south, the thermodynamics were cooperating, but the shear wasn’t there. Throughout the afternoon, things looked bleak. Storms fired all over the place in the moist air to the south, producing cool outflow and wiping out any chance for new convection nearby. It was late—after 6 p.m.—when we finally saw a glimmer of hope. A weak storm sprung up south of Goodland, Kansas, just north of the cold front. We got into position just south of the shower to find very few paved roads, but a nice pool of moisture just in the storm’s path. It was a race against the clock for this storm, as a very strong outflow boundary was rushing northward toward the storm, sparking off additional showers along the way. The weak storm impacted the original front and tapped into the moisture, quickly gaining strength. Then, the outflow boundary hit at just the right time for some fascinating meteorology to take place. The storm had strengthened just enough to keep the cold air at bay while still taking advantage of the vorticity generated by the boundary collision. Immediately, rotation ramped up at the updraft base. For a period of about five minutes, strong counter-rotating vortices were produced by an outflow surge. The cyclonic circulation lowered a bit and suddenly was rapidly rotating. We performed a handful of transects through the forward flank, inflow notch, and circulation center, but there wasn’t enough time for the storm to produce a tornado before the cool outflow took over, although it came closer than we had expected.